An Entity XF in Grand Theft Auto V.
High taxes, socialism, constant darkness… Sweden really is proof that, if you fill a country full of hot women, people will put up with a wretched landscape. By pussying out of armed conflicts for the past 200 years and focusing instead on investment in education, healthcare and manufacturing, the Swedes now enjoy one of the highest standards of living in the world. The result is a nation that's terrible at democracy but excellent at making ridiculously fast sportscars. The Overflod Entity XF is a two-door supercar featured in Grand Theft Auto V and Grand Theft Auto Online. The Entity XF's general design is heavily based on the Koenigsegg CC8S and Koenigsegg CCX. The front end features headlights which appear to have been vaguely inspired by the 2015 Acura NSX, while the rear has taillights with the external shape being heavily similar to those of the Koenigsegg Agera model range and the actual lights being adopted from the Lamborghini Aventador, Lamborghini Reventón, and the second-third generation Lamborghini Gallardo. The rear engine cover is also derived from the Porsche Carrera GT. The Entity XF's front end has a fairly simplistic style, with the front bumper being elevated to both sides of the central area. The bumper uses a small CFRP splitter at its base and features three front ducts inset in the bumper, the central duct spanning 2/3 of the car's width. Like its real-life counterpart, the car features large ducts on the sides of the front bumper. The headlight units have edges parallel to a number of the car's body lines and feature a set of four clear, circular lamps. The car's bonnet features two impression levels: the first creates a central area that runs from the base of the windscreen to the front of the bumper, and the second is contoured to the base of the windscreen and side boundaries of the central region. The sides of the car are very boldly styled. The wheelbase features a CFRP lip at its base. The sides of the car are dominated by a wedge-shaped impression that allows airflow to the main engine air ducts. Behind the impression is a CF body accent. The body then curves until a flat, horizontal section of the body is reached, upon which aerodynamic wing mirrors are mounted at the front of the doors. The main section of the car's greenhouse is particularly unique: the windscreen, side windows, and roof are arranged in a bold C-shaped arrangement. Behind the C-shaped section's seats are two large bulges that sit in an impressed area of the rear. The wheels are five spoke, wrapped in low-profile tires. Normally, the Entity XF spawns with two large exhausts, which can be modified into a three-exhaust triangular arrangement (1 above and 2 below) on each side, yielding a total of six exhausts. The spoiler which can be added at Los Santos Customs is based on that of the Koenigsegg Agera R.
Unlike its main inspirations, the Entity XF's door type is that of a conventional car. GTA V, final game (Rear quarter view). 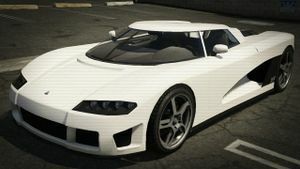 With the ability to reach 240 mph (386 km/h), the Entity XF is one of the fastest cars in GTA V, capable of fighting against Zentornos, Cheetahs, and Banshees. It has a 4.5 L 800 hp engine capable of propelling the car from a standstill to 60 mph (97 km/h) in 3.5 seconds. Upon inspection of the engine, a V8 can be seen. What is interesting is that the Entity XF is capable of burning off excess fuel from its exhaust when shifting gears, much like the Buffalo, Infernus, Banshee, and F620. Owing to its rear mid-engine, four-wheel-drive layout, the car is very grippy and responsive as well, making it a great racer. It has the highest traction rating of any vehicle in the game thanks to its all-wheel-drive system and excellent weight distribution. Examination of the handling.meta file shows that the Entity XF should statistically be faster than the Adder. The Entity XF can be customized at a Los Santos Customs outlet, with the following options. Stock options and performance upgrades (brakes, suspension, etc.) are not listed. The Entity XF is purchasable from legendarymotorsport.net for $795,000. The Entity XF can also be obtained from the mission I Fought the Law, by killing Sebastian, which causes mission failure yet allows the player to keep Sebastian's car. Can sometimes be driven by the aggressive driver, except in the enhanced version. The Entity XF and Cheetah are the first cars to include only a single windscreen wiper due to the unique C-shaped greenhouse arrangement. The Entity XF is the second fastest car in Grand Theft Auto V and Grand Theft Auto Online, topping at 240 mph (386 km/h); it is only beaten by the Adder's 250 mph (402 km/h). The Entity XF's default radio stations are Los Santos Rock Radio, Radio Mirror Park, and Vinewood Boulevard Radio. The Entity XF emits a horn noise shared with the JB 700 and Cheetah. An Entity XF can be modified at Los Santos Customs to resemble the Koenigsegg CCXR. This page was last modified on 6 July 2015, at 17:46.